Siemens’ technologies enable delivery of 75 per cent of the UAE’s daily water supply; represent more than 40 per cent of overall power generation capacity; and facilitate 50 per cent of operations in its aluminium and steel sectors, said the global technology powerhouse in a new report. The second annual report, also known as ‘Business to Society’, demonstrates that during financial year 2018 and coinciding with the Year of Zayed the company’s business goals aligned with the ambitions of the UAE, its government, its people and the broader society. The Year of Zayed marks 100 years since the birth of the founding father of the country, the late Sheikh Zayed bin Sultan Al Nahyan, who had emphasized the importance of giving back to the community. The report found that Siemens is a significant contributor to key sectors of the national economy, and its activities are helping drive economic progress, expand jobs and training, support home-grown innovation, and add value to the country’s many sustainability priorities. With 90 per cent of the gross value added by Siemens to the UAE economy occurring in the non-oil sector, the company is providing strong support to the country’s ongoing transition towards a diversified, knowledge economy. In other vital industries, Siemens solutions enhance half of the country’s port logistics, 92 per cent of its baggage handling and 86 per cent of its air cargo operations, added the annual report entitled, ‘In the UAE, for the UAE – Making real what matters,’ detailing the company’s activities and impact in the United Arab Emirates. However, the company’s contribution goes beyond traditional industries to support key national development priorities by working with more than 800 small and medium-sized enterprises (SMEs). Meanwhile, Siemens Healthineers’ medical equipment facilitates over 600 medical decisions per hour. Siemens directly employs 2,700 highly skilled workers and enables an additional 16,200 jobs across the UAE economy. Through training and education programs in the UAE and abroad, Siemens has supported more than 150 young Emiratis to gain new skillsets and international experience. Meanwhile, a Dh425-million ($115.7 million) software grant to five UAE universities is equipping more than 3,850 students with digital experience, using Siemens’ versatile Product Lifecycle Management (PLM) software. “We are proud to present this report which demonstrates how our activities and operations in the UAE align with the values and goals of the late Sheikh Zayed bin Sultan Al Nahyan,” said Dietmar Siersdorfer, CEO of Siemens in the Middle East and UAE. As part of Siemens’ commitment to supporting innovation and building a knowledge economy, the company employs more than 20 UAE-based software developers in the areas of Internet of Things (IoT), Artificial Intelligence and Machine Learning. These developers work closely with customers to co-create solutions that meet their challenges. 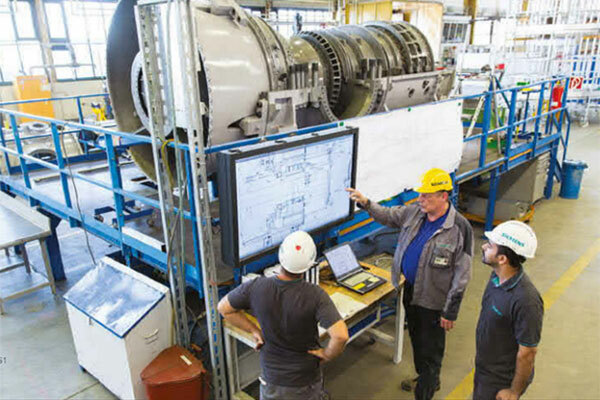 Overall, Siemens’ work with customers is enabling 35 per cent of the automation in the UAE’s manufacturing facilities. Siemens has also opened two new MindSphere Application Centers in the UAE to support its customers’ digital transformation and co-create solutions with them in areas of airports, cargo, logistics, oil and gas, and process industries. In the field of sustainability, Siemens has provided energy efficient solutions that have reduced CO2 emissions in the UAE by 4.76 million metric tons during the fiscal year, while its advanced water-cooled chiller systems cut annual utility costs by more than 30 per cent in the country. Sustainability begins at home for Siemens, whose regional headquarters in Masdar City averages 55 per cent greater energy savings and 47 per cent lower water use, compared to standard UAE office buildings.